Big or small, we all have competitors we have to contend with. But what’s the best way to deal with them? How can we identify who they are? How do we stack up? And how can we use this information to better our accounts? Both Sean and Andrew gave great ideas for better analyzing competitor behavior and finding opportunities you can leverage. 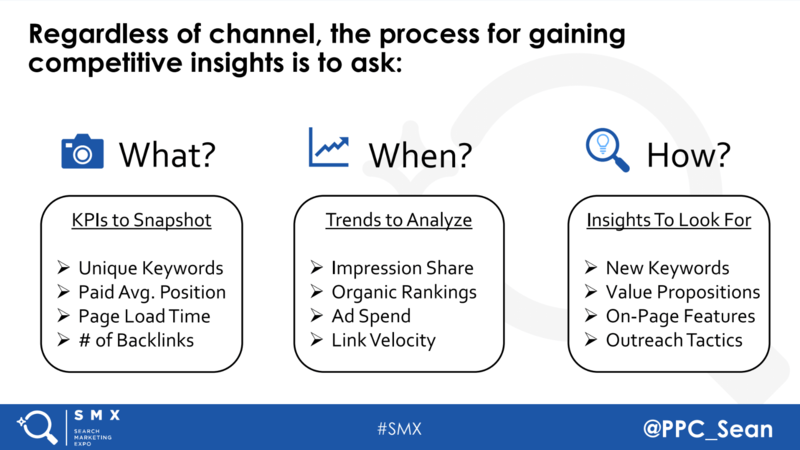 Andrew Ramm and Sean Murphy outlined strategies to stay ahead of the competition during SMX West. Here’s a recap of the session’s key points. Ramm comes from the product side rather than marketing, but shared his ideas on how they can overlap. He discussed the need to understand the your unique positioning or your “hedgehog” and what sets you apart from competitors and defines your brand? What are we excellent at? What is the value we can give to our customers? Lastly, he gave an example of how these can interact in the real world with a personal favorite of his: Reverb. They not only sell guitars, but they create content about deeply specific but interesting topics that speak to their audience of musicians who care about the music they make, listen to, and support. Both presenters discussed multi-step processes to conduct competitor analysis and although some strategies overlapped, both provide unique looks at different data segments. Murphy added KPIs to review for each stage of his 3 step process. Whether you’re asking the what, when or how, it’s important to have metrics tied to your competitor analysis to give a measurable scale to improve upon in the future. Which brings us to the final point. Integrate into regular workflow and make this a part of your routine tasks on an account. Check back into auction insights and competitor tools frequently to see where things are changing. Make notes of those adjustments over time and you’ll can get a better sense of what your competitor’s strategies are and, potentially, a leg up in beating them. Automate the display of competitor information and create alerts to stay on top of changes. 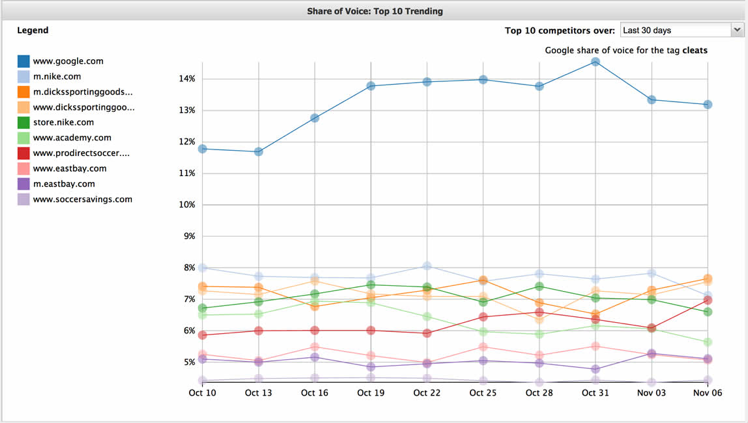 This script from Brainlabs is great for creating a visual representation of competitor data. Also, Google Alerts are widely used for our own brands, but why not our competitors? Set up an alert and get notified each time there’s a change in the landscape. Michelle Morgan is the Director of Client Services at Clix Marketing. She has honed her PPC skills over the past 8 years in both in-house and agency roles, managing accounts in many different industries and markets. Her passions are around audience targeting and cross-channel dynamics between search and social. She’s a regular industry speaker at events like Pubcon, SMX, HeroConf and others. In 2018, Michelle won “SEM Speaker of the Year” at the Search Engine Land Awards.